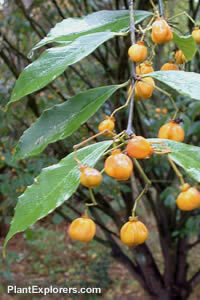 This large evergreen shrub, or small tree, has dull to glossy bright green leaves, smooth dark grey bark on the branches, and produces bright yellow-orange fruit that can persist through much of the winter, when conditions are favourable. Rarely seen in Western gardens, this small tree or large shrub is well worth consideration. For maximum freshness, please keep the seed refrigerated in its original packaging until it is time to plant. Sow seed in containers in autumn to spring in a cold frame. If planting in the mid to late spring, stratify the peeled seed by refrigerating the pots for 4-6 weeks. Grow in any well-drained soil in full sun or light shade. In full sun, needs moister soil.